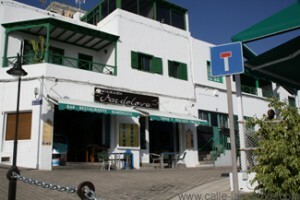 The restaurant „Mardelva“ is located in the Calle Los Infantes above the old harbour in Puerto del Carmen, just off Calle Teide. It advertises itself as “fresh fish and tapas”. When I first went there some years ago, I was not particularly impressed. A combination of wrong or late food and the rolls and butter trick were enough to put me off for several years. That is, until I received a tip that the quality of service varied depending on the staff who were on duty. So armed with information on which waiters and waitresses to watch out for, I went back there this year. One of the disappointments during our last visit to Lanzarote was finding that the restaurant “La Rueda II” had closed, as we had not only enjoyed the food there but also the view from the balcony overlooking the harbour in Puerto del Carmen. Whilst we were able to eat Mexican food at the equally delicious “Emma’s Cantina”, just a short walk away in Calle Teide, our vote for a restaurant overlooking the harbour this time went to “Puerto Viejo”, which is located almost directly below Rueda II. We liked the fact that it was one of the few restaurants on that corner, where you did not get asked if you wanted to eat there every time you walked past. That, the choice on the menu and the general good condition of the restaurant tempted us in. But we also liked the fact that once seated we were still not hurried into making decisions. The food was very well cooked and with the restaurant half-open towards the harbour, the view was good as well! In fact, the kitchen is located next to a passage-way on one side of the restaurant, where anyone passing can see the food being prepared. This is surely a good way of keeping up the high standard! 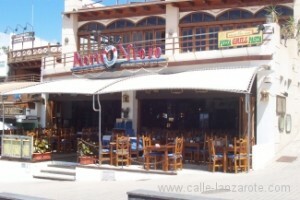 We can recommend the Puerto Viejo to anyone looking for good food in the harbour area of Puerto del Carmen. ich habe den Text gelesen und meine Korrekturen in Rot dazu geschrieben. Es sind nicht wirklich viel. Im Anhang erhalten Sie die eingescannte Blätter. Many countries are renowned for their street traders selling anything from watches to sun block along their beaches. Puerto del Carmen has a different type of trader – the flashing toy merchants. They prey on unsuspecting families around the harbour after dark, their wares flashing away in bright colours, in the hope that the small children will be so fascinated that their parents will be unwilling to say „no“ on holiday. One of the tricks it to get a small child to actually take the toy, making it even harder for the parents to avoid having to pay for it. A favourite spot seems to be the playground near to the boules. Here they do not like taking no for an answer – in any language!